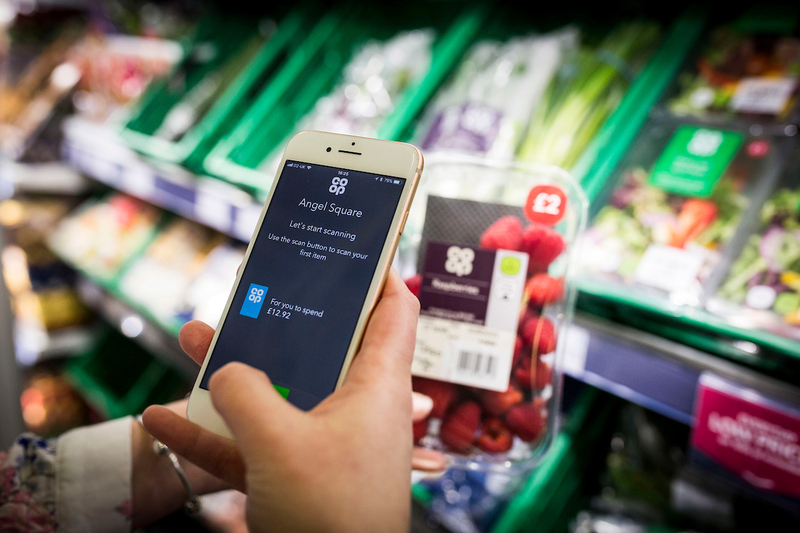 Co-op has unveiled a trial for the future of its shops where customers can check-out their own purchases on their mobile phone using pay in aisle technology, without visiting a till. The shop, scan and go initiative – with an innovative App built with Mastercard’s secure digital payments expertise – is being trialled at the Co-op’s store located at the retailer’s support centre in Manchester, with a wider roll-out beginning as early as this summer which is expected to include a further trial at the Co-op’s store located in the UK HQ of Microsoft. The innovative move, which harnesses the latest technology, allows customers to scan products on their own device as they walk around the store – known as a “frictionless shopping experience”. When they have finished shopping, the amount they owe will then be deducted from their account with a single click. “It is a challenging market place for retailers, and the Co-op is responding positively. Our ambition is to harness technology to deliver the shopping experience that our diverse customer-base requires – when, where and how they need it,” says Matthew Speight, Director of Retail Support at the Co-op.